This is a perfect Sunday family lunch. In a medium sized saucepan melt 3oz butter and add in the diced onion and dried mixed herbs. Allow the onion to sweat off for a few minutes until it has softened but not coloured. Next add in the breadcrumbs and the grated lemon zest and mix well. Allow the stuffing to cool down completely. Meanwhile prepare the chicken by wiping out the cavity with some damp kitchen towel. Line the cavity with a little parchment paper and fill with the cooled stuffing. For extra favour, rub some additional butter into the breast of the chicken under the skin. Place the chicken on a roasting tray and roast in the oven for 1¼ -1½ hours until completely cooked through. Place the potatoes in a large bowl with the roughly chopped garlic. Season lightly with a little salt and pepper, drizzle with olive oil and mix well until combined. Place the potatoes onto a flat baking tray lined with a little parchment and bake in the pre-heated oven for 35-40 minutes. Place the diced swede in a large saucepan of cold water. Bring this saucepan to the boil, reduce the heat slightly and continue to cook until the swede has softened sufficiently. Strain off the water and fit with a tightly fitting lid to allow the swede to steam and soften a little further. Remove the lid after 2-3 minutes, add 1oz butter together with some salt and pepper and shake lightly to coat the swede with the butter. 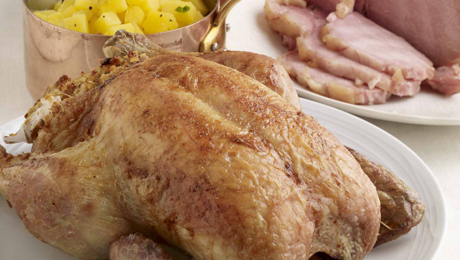 To serve, carve the chicken into thin slices and serve with the roasted potatoes, herb stuffing and buttered swede.